Oh, Canada! 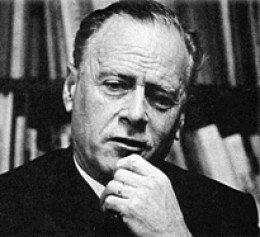 : Marshall McLuhan and Reading the Media: is the future of communication at risk? Marshall McLuhan and Reading the Media: is the future of communication at risk? Source: Wikipedia photo detail by Horst Ehricht. This statement was made by a man who did not live to see Facebook and nor did he ever google for information. Surprisingly, McLuhan understood the Internet before it was actually in use. Now that technology has caught up with McLuhan, suddenly his ideas are new again. But what exactly was he saying about media and how are his ideas and observances relevant today? It's all very well to talk about Gestalt positioning and tetrads of media effects if we are studying the subject but for many of us, the important messages are lost in a sea of academia and that defeats the entire idea of message and media. Let's unravel this from the beginning. First of all, what is media? Medium (noun, singular) is a method of expressing something. Media is the plural form. For example, we may refer to the broadcast media to indicate all forms that broadcast information like newspapers, television and radio. In common usage, sometimes the word media indicates the singular. Also the word mediums has been used to indicate plural. Fig. 1: Magura Cave in Bulgaria. Artwork on the walls dates back to about 12,000 years ago. Fig. 2: Chinese writing found on Bronze Age articles is little changed from its earlier roots in Oracle writing found on bones and turtle shells. There are many types of media and the subcategory list is growing almost daily. The first on the list is language. Word of mouth is very powerful and, in fact, responsible for the development of world religions. A picture is worth a thousand words and a case in point is illustrated at right in Fig. 1 where one can easily see the hunting stories on the bottom while the top area is believed to be religious or spiritual in nature. 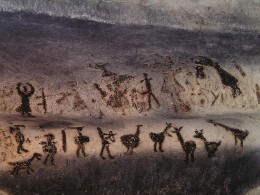 Even the earliest cave paintings are quite sophisticated and date back nearly 35,000 years. We can only speculate on what role they played for early man but one thing is certain. They conveyed a message. Visual imagery was often present in written language as well. 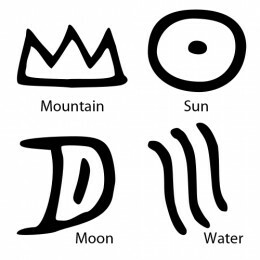 Egyptian hieroglyphics and ancient Chinese characters were based on images as seen in Fig.2. With this combination of visual idea and spoken word, we have the first form of mixed media. Are you in touch with your inner early wo/man? Try your hand here at reading some ancient Chinese symbols. Use Control T (Win) or Command T (Mac) to open it in a new window so you won't lose your place here. Next comes more sophisticated tools like papyrus and ink; paintings and drawings were created. Mass media began with the Gutenberg press when suddenly books and therefore ideas were made available to the masses for the first time in recorded history. Things are getting interesting. Back to "the medium is the message"
Although McLuhan's statements can seem cryptic and contradictory at times, this particular statement makes a lot of sense. The message can be the same but our experience of it is radically different depending on how and through what medium the idea is presented. Below are images that both say the moon. When we add more information to the subject of the moon, we can present it in a chart with written words naming each phase and the photo that illustrates it (Fig. 3). This is how information was conveyed for centuries. It required study, understanding, and memorization. Enter edutainment, a term coined by Disney in 1948. Perhaps the people with whom we are trying to communicate are not paying attention to the information. We want to reach people more effectively so we entertain them while we educate them. First, we used broadcast media like film and television. This has now flipped to interactive online video like YouTube. 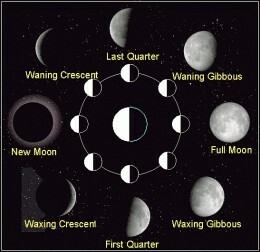 Notice how differently the same information about moon phases is experienced on YouTube. Note: Don't forget that every one of these edutainment methods comes with advertising which interrupts our engagement with the material and forces us to multitask. Welcome to Disney University. Essential services? Yes. At least some form of communication is now an essential service if you live in today's society. End-user access and usage is what made the phone companies into giants. Advertising is what made radio, television, and newspapers successful. The revenue generated supported the production and distribution and everyone made a tidy profit. Then came the desire to reach a larger audience. Cable and satellite companies were founded on the same principles as the phone companies and in many cases, were one and the same. Isn't this grand? Well, yes it was for awhile until the novelty wore off and the reruns began. The end-user got tired of paying more and more money for a passive experience. Yes, the content had expanded but it was mostly poor quality and there were still no choices other than to switch a channel at the required time or to turn off the machine. Big business had no such issue. It was a captive audience and communication was now a dictatorship within the western world. Six major corporations own over 90% of the communications market. For a better description of these giants or to read more from those with concerns about it, click here to go to freepress.net. Why would anyone be alarmed with this turn of events? Marshall McLuhan sheds some light in that direction. It also makes clear why there are so many people alarmed with the current state of media. This is indeed a new frontier and we must choose the tribe with great care, preferably a tribe that values and protects the voices of individuals. That is not what is on the tables of the communication war rooms right now. Okay, we understand the first part of the media is the message but McLuhan added another dimension to it. “Since all media are extensions of ourselves, or translations of some part of us into various materials, any study of one medium helps us to understand all others.” Media, as McLuhan describes, is not merely communications. It includes all tools for all human expression whether it be the manufacture of cars or the making of films. This is what he called the media ecosystem and he maintained that they had to be studied as media ecology and not just content analysis. Did the developers of the new Google algorithm do this? I don't know. The company incorporated some of it but it is highly doubtful that the entire media ecosystem was taken into consideration. We are just not that advanced yet. We are still mucking about inventing new devices that are almost too numerous to mention: iPhones, Blackberries and cellphones with sophisticated software made possible with android applications, iPads and tablets, eReaders, netbooks, laptops, and desktops. That is a lot of media and therefore, a lot of different messages. Need directions? Need to know what's on the menu in a restaurant in Thailand? There's an app for that. Many people are having trouble keeping track of all their interactions so there is more software invented to help us multitask and process the information across multiple platforms and multiple social networking sites. Tweet Deck is one. Does this alter our content? Absolutely it does. The change is a creeping change, too. People have written LOL in many places other than within a chat. Adapting takes time. We are in flux. We can't keep trying to fit old methods into new technology. For example, we should get the ads off YouTube. It's an archaic television model that doesn't work with an interactive Internet. Some enterprising people have already begun to adapt advertising methods that work with the new technology and are welcomed by the consumer! If you are curious how that could work, have a look at Kiip. Major companies don't need to panic and start demanding protectionist laws. They need to change their business model. There's no sense in demanding the right to charge people for horseshoes in the age of the automobile. So is communication truly at risk? Yes. Risk is part of progress. The results won't all be good but now is not the time to toss the baby out with the bathwater. We do need to tread a bit more carefully than we are accustomed to doing in the past but progress is inevitable. So are glitches. On the left are two roses that we may choose to send via text. One is long stem and thus carries a slightly different meaning. At right, is a stanza from the poem by Robert Burns. Today's language is starting to bear a striking resemblance to that of Bronze Age man. Perhaps in another couple of millennia someone will be digging up an oddly shaped article with a cracked window displaying the symbol of a rose. They will marvel at our ability to communicate and study this ancient language in an attempt to decipher the message but the composition of the media and the source of the ink will remain a mystery for a long time to come.